The Photo-OFF booklet, available at the roughly 100 spaces with shows in it, is a handy pocket size, but fairly thick, with well over 100 pages, and it divides the 100 shows into ten geographic areas. Unusually for Paris, these don’t correspond exactly with the arrondissements, but instead break up the shows into sensible groups mainly within walking distance – though in the outer areas you would probably want to jump on a bus or metro at times. Except for the six shows in the ‘banlieue’ on the east and west fringe of the city, each area has a date specified as the ‘nuit parcours’, when most if not all are open specially from 6-9pm, often with the photographers present. Most of these were outside the time I was in Paris, and I had other things on for the two that were taking place while I was there to attend these. This year for the first time there were also a guided walks for most of the areas (no booking required, just turn up), and two of these were taking place on the Saturday afternoon I was in Paris. These were not in the printed program but on the web site and the web version of the programme. Neil Atherton, an English phtoographer and curator who has lived in Paris for around ten years and founded Paris Photographique in 2004 was on the tour I took. He is the Commissaire General of the Mois de la Photo-OFF, and told me that this was an experiment, and the arrangements were made too late for the printed brochure. 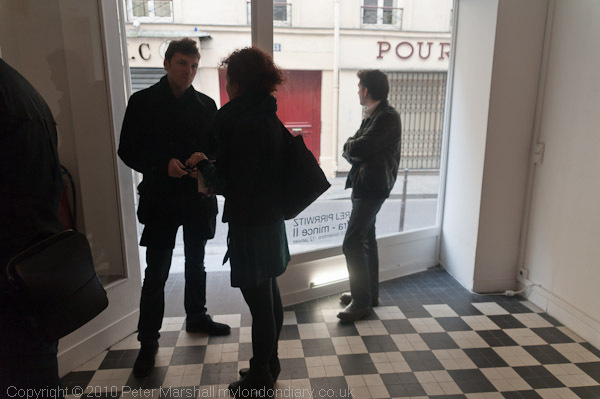 About a dozen of us met at the ‘Coming Soon Gallery‘, a newly opened space in passage Lemoine between the rue St Denis and the Boulevard de Sebastapol at the top end of the 2e. Gafsou’s pictures combine reality – photographed on film – with elements constructed and added in Photoshop, and occasionally contain deliberate clues to remind the viewer of this intervention. His subject matter, largely architectural views of bland spaces around the industrial edges of towns, appealed to me, and some of the images were truly beautiful in a very cool and classical way, but I did find myself wishing that they had been straightforward photographs. It was a reflection of my conviction that photography is essentially a means of examining and exploring reality, while this was work at a more philosophical level, questioning the nature of reality. For me it came at the expense of jettisoning the essential power of the photographic medium, reducing it to simply a way of making pictures. 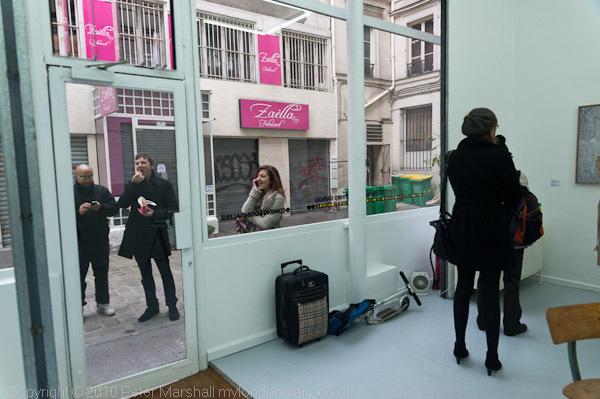 Our route took us to 8 of the 9 shows in the ‘Beaubourg‘ area (crossing the borders of the 2e, 3e and 4e) and in all but one we were met and introduced to the show by the gallery owner, photographer or, as in this first gallery both. 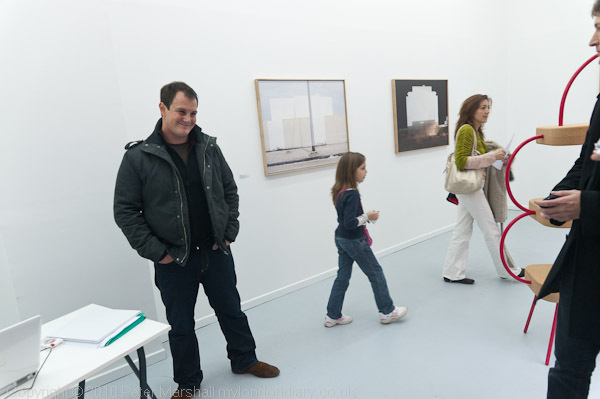 It was truly an excellent way to see the work and to get rather more from the experience than would be likely on an individual visit, and it would certainly be good to include tours of this kind as a part of the East London photomonth. Our next gallery was one I had particularly intended to visit, having been impressed two years ago by the work of Louise Narbo on show at Galerie Claire Corcia. She was again showing there, along with two other photographers, Sabria Biancuzzi and Vincent Descotils. 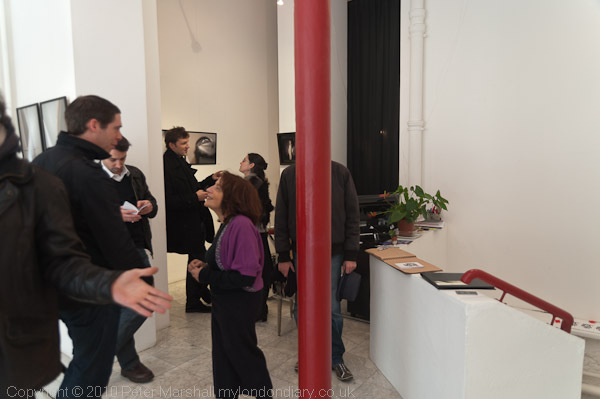 Descotils was present to answer our questions, along with both Claire Corcia who spoke about the gallery and the work and Daniele Neumann Lumbroso who told me more about Descotils work in English. Narbo’s work, pairs of colour images which resonated together, again impressed me, although I found it less interesting than her black and white work on my previous visit. You can see more about her on actuphoto. 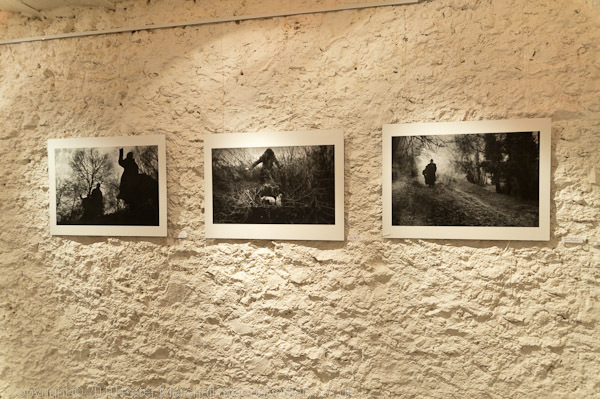 Descotils was showing two sets of work, and ‘Migre‘, a very filmic series on migration – atmospheric black and white images, with a couple of people fleeing through a forest – had a tangible sense of urgency and fright and stood out for me. These photographs are also the inspiration for a performance at the gallery by ‘La Planquette des Animaux Humides‘ on 11 Dec which sounds exciting, though would certainly over-tax my French. Our third visit was to the Galerie Riff in rue Chapon (a branch of the main gallery in Strasbourg), where the work of German photographer Andrej Pirrwitz (b 1963) was on display. These large colour prints were taken inside abandoned buildings, which also included a figure either in bright clothing or naked. Although I found a couple of these worked well, in others I simply found the person – sometimes blurred by movement – simply an annoying irrelevance. But then I’m always attracted to the kind of old abandoned interiors that were used in some of these pictures, perhaps former hospitals, factories or institutional buildings. I spent some time while we were there – our schedule allowed 15-20 minutes for each gallery – looking through a book of Pirrwitz’s work, and as so often found it more suited to this format than the gallery wall. This entry was posted on Wednesday, December 1st, 2010 at 10:33 am and is filed under My Own Work, Photographers, Reviews etc. You can follow any responses to this entry through the RSS 2.0 feed. You can leave a response, or trackback from your own site.